The highly respected UK publications Which (formerly the Consumer's Association) and its sister publication Drug and Therapeutics Bulletin (DTB) have long pointed out the failure of the MHRA (the UK drugs regulator) to act in a transparent manner or to provide reliable and timely information to doctors. DTB has always been wholly independent of the pharmaceutical industry, Government and regulatory authorities. Earlier this year, the Labour government pulled funding for distribution of DTB to doctors without any consultation (Hansard) attenuating this reliable information source. Why it did so can only be guessed. Which? 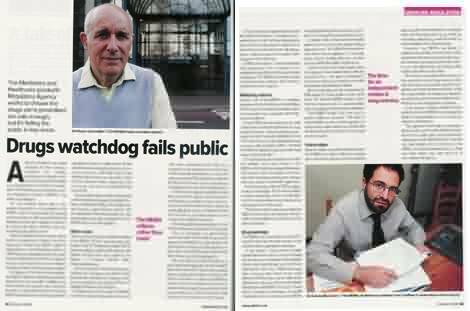 (October 2006 issue) continues to highlight the problems, touching also on the Sheffield MHRA "investigation". At least someone is stating the obvious. Nice comment in Guardian article yesterday "US court ruling shuts door on drug claimants' compensation hopes"
Guardian Link Clare Dyer and Sarah Boseley Saturday October 7, 2006. "But Judge Carol Higbee of the superior court of New Jersey refused them permission this week to go ahead in the state, where Merck has its headquarters. She ruled that the British legal system would provide sufficient redress and a US jury should not be expected to comprehend a foreign system of drug regulation. " She assumes that anyone can understand the UK system of drug regulation. A UK jury wouldn't understand either! "Martyn Day of law firm Leigh Day & Co, which with two other firms filed 200 Vioxx cases in the US, said: "We are in a total quandary. I am totally stumped as to how we can get these cases into the courts anywhere." He said the Vioxx case was "the strongest drug-related case we've seen in the UK for a long time" and the situation left little hope for other drug cases. " They should consider suing the MHRA. I liked the bit [in the Which article] about MHRA having a responsibility to enable rather than hinder the development of new products. Hasn't anyone told them what a regulator is for?